Mike and I love our tech gadgets! But something I’ve come to realize over the last few years is that we tend to purchase tech online these days without trying it, testing it, feeling it, in person first. It’s like the feeling you get when you’re holding and reading from a physical book. It’s a nice feeling, right? But I’ve been missing that feeling for certain things like that—including physical tech. Why wouldn’t you want to hold, click, touch, test before you commit to buying something like tech? And in an increasingly digital world, it’s sort of nice to go back to how we used to shop. That’s something I got to do this month as a Team TELUS ambassador, when I visited the TELUS Connected Experience store in Southgate Mall. Note: as a Team TELUS ambassador, I write about different ways TELUS makes my connected life easier and fun throughout the year. This is a sponsored blog post. Mike getting lost in gadgets at the TELUS Connected Experience Store. 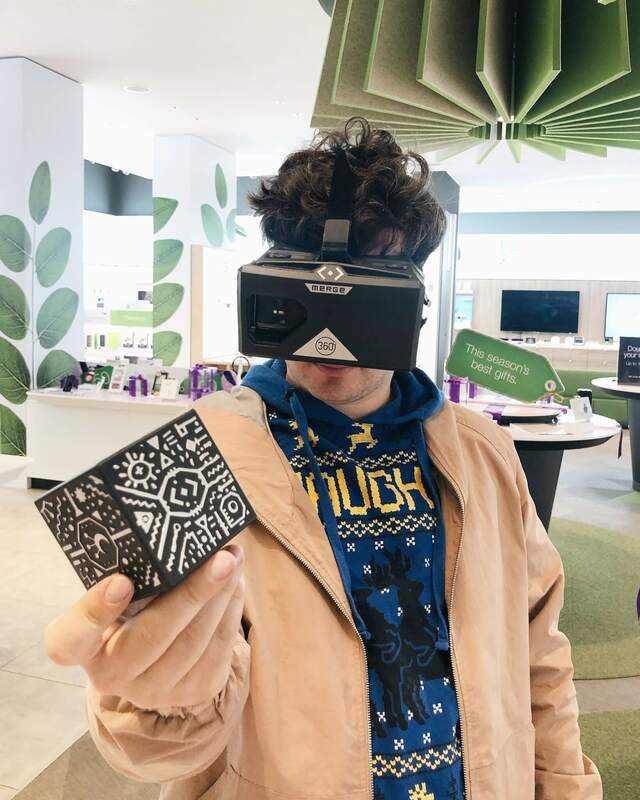 TELUS’ Connected Experience concept stores are like a playground where customers can touch, test and play with more than 1,000 curated tech and gadgets meant to help enhance our digitally connected life. The Connected Experience stores showcase the latest phones, headphones, health/fitness tech, speakers, tech toys, smart home devices, and other gadgets that often integrate with one another (connected!) and ultimately enhance our lives. Honestly, it had been a long time since I had touched and tested products in a physical store. It was really nice! Below, I’m recommending a few tech/gadgets you can get a TELUS Connected Experience Store this holiday season (gift it, or get it for yourself). You can also keep scrolling for details on how to enter my giveaway for some fun tech too: a Fujifilm Instax Mini 9! Mike, trying the Merge VR Googles and Cube! Who knew experiencing virtual reality could be so affordable? I was excited to see that the Merge VR 360 Googles and Merge Cube come in at under $30 each (the goggles are $29.99, the cube is $19.99—both currently on sale). The goggles themselves include hundreds of apps and virtual reality experiences so you can experience literally almost anything, while the cube is a really neat device that combines VR with augmented reality—games, holograms and other puzzles. It was really fun to play with in store! Okay, you can also enter to win one of these beauties below, but if you want to guarantee owning a Fujifilm Instax Mini 9 Camera, you should just buy it yourself! This isn’t new tech, but it’s so awesome that I’d include it on any gift giving guide, anytime. These compact cameras come in multiple colours (I have white but also want the pink one lol), is super easy to use and is really a nod to the olden days of polaroids. Point, shoot, and immediately get a photo print. These Instax cameras are so great for events, travel, you name it! Currently on sale for $79.99, and if you did want a newer version, there’s an SQ6 model that’s currently only in available in stores. Mike and I were pretty torn on whether we should have gotten Amazon’s Echo (Alexa) or the Google Home. If there had been a deal like this when we were in our smart home assistant search, we may have gone for Google lol. This holiday, TELUS is offering Google Home Minis at a Buy One, Get One Free special! They’re also on sale from $79.99 down to just $39.99! We love our smart home assistant. If you haven’t gotten one yourself, this is a great time to try it! That’s not all though, TELUS is offering a few pretty sweet holiday deals like ‘Double the Data’ (pay half for double the data, inquire in-store), get an Amazon Echo for free if you buy a Samsung S9 or S9 Plus, all Beats headphone products are 30% and they’re offering 20% off a 3-pack of any phone case, screen protector and charger. Thanks to Ajay from the Southgate Mall TELUS Connected Experience store for talking about the store concept and the popular tech/gadgets + TELUS deals! 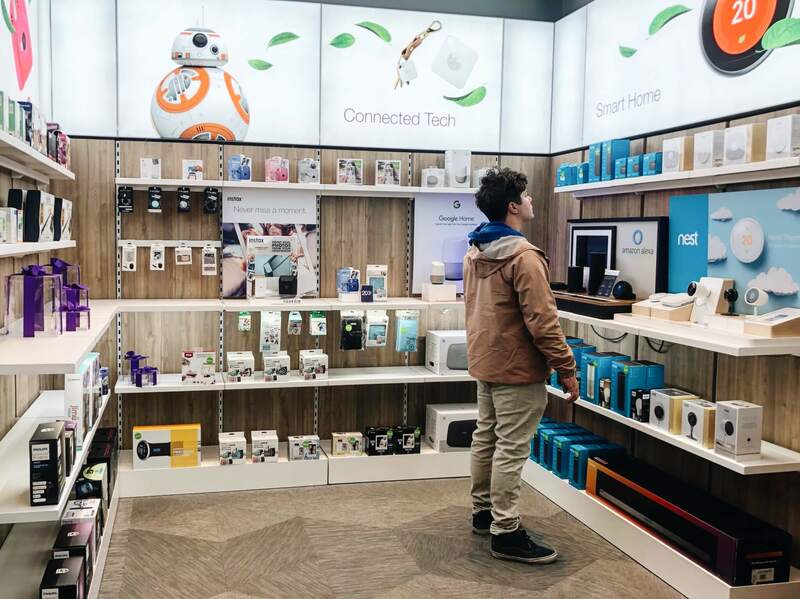 And if you can’t make it to the Southgate Connected Experience store, the TELUS retail stores in the area Edmonton area including West Edmonton Mall, St. Albert and 34th Avenue will have you covered, too. Alright, now for the freebies! Now that you’re all excited about tech gadgets, enter to win one! 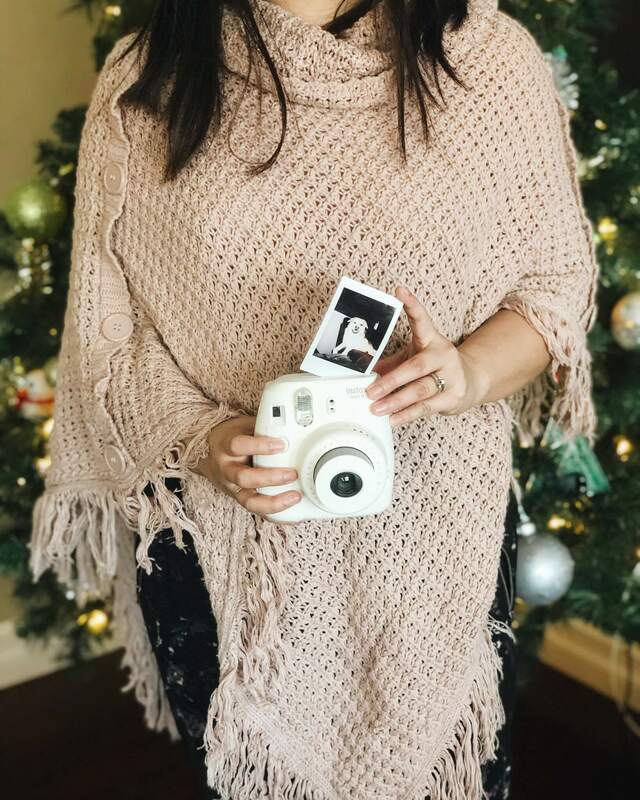 I have a Fujifilm Instax Mini 9 and I love it and I’m excited to be giving away one for you this holiday season. I whip out my Fujifilm Instax for a lot of occasions, and when we’re talking about that ‘feeling’ of physical touch, the Instax camera really satisfies that too with its instant print-out polaroid. Enter to win a Fujifilm Instax Mini 9 courtesy of TELUS! Leave a comment on this blog post telling me what your favourite tech in your life is and why! Note: the blog comment is a mandatory entry. You must leave a comment in order to qualify to win. Leave a comment on my Instagram post tagging a friend! I will randomly select a winner from all entries received by Jan. 2. Please note: comments are moderated so if your comment does not appear right away, no need to re-comment! Disclaimer: This blog was posted as part of my #TeamTELUS brand ambassador partnership. I’m a proud member of #TeamTELUS! This has no impact on opinions stated in this post. I love tech, and I love the connected tech that TELUS offers! Also, I really love my Fujifilm Instax Mini 9 and can’t wait to give it away for one of you! My favourite tech device is definitely the smartphone! Favorite tech right now is definitely Google home and being able to play music and dim our lights on both floors of the house! I love my home mini google. It just makes life easier. And so would this camera. Going on a mission to an orphanage in Africa soon. Would love to capture every moment!! My iPhone is everything in my life and gives me instant access to information. My favourite tech device is my smartphone. A lot of memories on it. My iPhone as it replaces so many other devices and keeps me connected. My favourite techie type thing is a toss up between the family iPad and my iPhone. We recently got a free Alexa dot with our purchase at Superstore; the kids have been asking Alexa everything under the sun! I love all of our smart products in our home. Our lights, blinds, front door lock, garage door, and a few smart plugs are all connected and it’s awesome. I love that I can talk to my watch and control all the automated devices! My favourite tech is my Samsung S9 Plus; it does everything and the battery life is amazing. My iPhone. Can’t live without it. I’d be late for everything without it. My smart watch! I like keeping track of my steps, keeps me more healthier and more competitive. My phone, which is also my camera, is my fav tech item in my life at the moment. I love taking photos (sometimes too many) and memory keep easily with it. My iPhone is my biggest piece of tech that I had but would love to try a smart watch too! My iPhone is the most important piece of tech in my life! These are cool tech gift ideas though, thanks for sharing! I would absolutely love the Fujifilm Instax Mini 9 to capture awesome moments with friends and family!! My favorite tech is my iphone! My favourite tech is my smartphone!! My iphone is my favorite! It gets me through the day and keeps me connected to my family and friends. My favourite tech is my phone! It can help me to multitask and accomplish so many things to stay connected and take photos!! Favorite tech has to be my phone! I can read, write, play music, listen to podcasts, watch videos, look up recipes and so much more!! I love my iPhone! I have had one for so long I don’t think I could live without it! I just bought some Bluetooth headphones and I love the noice cancelling and wireless feature!! My favourite is my bluetooth speaker. I take it anywhere without even the shower without worrying about plug-ins and wires. My favourite tech is my phone! Cause I manage social media accounts and it has 3 lenses for great photos! My favourite tech is my iPhone! Like many of the people above my iPhone! The fact that o can take photos, listen to music, podcasts and stay in touch with friends in family. I take it with me everywhere! My favorite tech is my cell phone, so handy, portable reliable. It’s my go to tech item! My iPhone. What can’t it do? I love my mini iPad. It’s small so I can throw it in my purse and take it everywhere with me. And so handy! I know it’s unoriginal but my phone! I have to say that the Harry Potter coding kit sounds AMAZING. My favourite tech is my portable projector. As I can carry with me anywhere and watching anything I want or play games with the kids on it. Right now it’s my iPhone but I’m hoping soon it will be an assistant for our home! Can’t live with my smartphone! My iPhone because it helps me with everything! I can’t live without my Beats X wireless headphones. Wireless tech changed my life. I would always wear those wires headphones that would come with your phone, but I can’t count the amount of times they would be ripped right out of my ears because they would get caught on something. Wireless headphones is the way to go! My favourite tech device is my MacBook Air! I love the playstation VT set and beat sabre! I don’t game much but it makes gaming fun! I cannot live without my iPhone. It’s a planner, an alarm clock, notebook and so much more that I use on a daily basis. My iPhone is still my favorited tech item. I do everything on it. I love my iPhone because there are so many free and useful apps available for downloading. Would be really cool to win one. Thanks! My favourite piece of tech without a doubt is my iPhone!! I live pretty far away from my parents and we have a group chat between us and my sister and we talk to each other daily! It also lets me send pictures of my adorable rescue puppy Pickles 😍😍!! I’d looove to win this contest to have more creative ways of taking cute snaps of him!! My phone for sure! I can connect with friends and family, take photos, and navigate any city thanks for having Google maps at my fingertips!! My favourite tech, that’s a tough one. It would have to be a tie between my Samsung note 8 phone and my Olympus camera. Definitely my iPhone. It keeps me connected to family that lives in other cities/countries! My favourite tech toy in my life right now, would have to be my iPhone XS mainly for the fact that I love to FaceTime my mom so she can match my children grow up with us! My favourite tech gift is the Samsung galaxy smartphone series! Any one of them is a truly great gift and I’ve had the pleasure of organizing the gifting of one this year! My favorite tech at the moment is my new Samsung Note 9. The pen has been indispensable in all of my holiday list making! I loveee my iRobot vacuum as I dislike vacuuming with all my heart! Favourite tech toy…. without a doubt our Dyson Animal vaccum. That counts as tech right? We’d be suffocating in a mountain of Chili fur without that puppy. No pun intended. My Panasonic Lumix has been so good to me… but I have been wanting the Fugi instamax for ages!!! Pick me!! My Panasonic Lumix but I have been wanting this camera!! Definitely my iPhone! It keeps me connected to what’s going on in the world. My smartphone. I use it every day. My favourite tech is definitely my iPhone! Thanks for the chance. Tweeted (mommy2fiveboys), instagram andrea_hockeygirl and Facebook Andrea Amy. Merry Christmas! The iPhone is my life!!! My number one tech item is my iPhone. It takes on all the most important tasks- searching out review of businesses (so I can make the best selection), takes amazing photos and keeps me connected to all my loved ones. Tech makes life easier!!! Such a fun giveaway. I got to say the best piece of tech that I love is my iPhone 8 because it allows me to take videos photos of my greatest moments and memories. Plus what I do you is leaving reviews at businesses such as restaurants auto dealers and dental offices. I got to say the best piece of tech that I love is my iPhone 8 because it allows me to take videos photos of my greatest moments and memories. Plus what I do you is leaving reviews at businesses such as restaurants auto dealers and dental offices. My only iPhone 8 allows me to do this with ease and helps other businesses get customer reviews. I love my phone and my computer equally. They help me work, play and aspire. I dream of finishing a project but it’s finding the time and perhaps this upcoming year will be the one I put me first…. My phone and my computer are used for work, play and aspire me to fulfill my dreams… maybe this will be the year! My iPad (various versions) with cell has been my connection tool, entertainment centre, travelling aide, since 2012. Love it more that smartphone! I have the google home assistant and love it!! It’s definitely my favourite tech gadget! I love my smartphone it is a lifeline to keep me on track with my busy life! My favourite tech is definitely my iPad! It lets me do work, read books, and watch flicks on the go whether I’m home or traveling. Definitely my iPhone 8. I keep my life organized through it and would be lost without it. Love your Instagram page! This is such an awesome giveaway. My fave tech is totally my phone for obvious reasons. I also love a good heated seat/steering wheel 👌🏻 perfect for Edmonton haha. My favourite tech product is my IPAD. I just bought a keyboard for it and now I’m loving it even more. It’s like a mini computer for me. Definitely my phone! It tells me when and where to be! My favourite tech device is mi iPhone!! I would have to say my lap top is. Its the only this I have lol. My cell is very old but my laptop is just 3 years old and works well. Thanks! Love the google home mini. Game changer especially in the kitchen for hands free cooking. Operation Kevin hummm I think I’m doing this next year. I love my desktop computer. Sitting in comfort, drinking coffee, enjoying your blog posts. My iPhone is the gadget I spend the most time with and is indispensable. On my wish list though is the Nintendo Switch. I am also intrigued by these instant cameras and how they make one nostalgic. My laptop because it got me through my undergrad! As much as I love alllll the tech we have in our home, my iPhone still comes out on top. It’s amazing the technology we have at our hands (pun not intended) in this day and age! My favourite tech device is my iPhone mostly so I can take photos wherever I go and share them with family and friends! My iPhone 7 is by far my most needed and used piece of technology! My favourite tech is my laptop. My favourite tech is my 2017 MacBook Pro. It runs super smoothly and it’s a solid piece of tech! It’s pretty much my phone but bigger. My favourite tech is my JBL wireless headphones. Convenient and noise-cancelling headphones to rock out while doing chores. I love my Surface Pro. Tablet and computer in one. My favorite tech is my Google chrome!!! I love my iPhone! I get so much done on it that I can’t imagine life without it. My favorite tech device is my phone! Currently use a Samsung S8 and it’s so handy for everything… texting, social media, amazing camera, GPS. I am a very low tech person. I have a Smartphone, but sometimes, I am not “smart” enough to use it thoroughly. Right now, the timers on my Christmas lights are about the best “techie” thing I am enjoying right now. Definitely smartphones! You can do everything in ine simple tech gadget. My favourite is my Apple iPhone 10. Get many uses out of it such as a great camera, and lots of fun features. Works great when the kids need some entertainment too. I love my smartphone! I recently travelled abroad and it’s amazing how easy it is to stay connected with everyone at home using my device! I’m a wannabe techy, so I have to say my iPad is the the most techy thing I own that I love ! My favourite tech is my ereader. I read so much more now that I can read on transit. My Samsung S5 is currently my favorite peice of tech, hopefully to be replaced soon with my next favorite peice of tech! S7? S10? My favorite tech is my Kobo. I’m an avid reader and it makes reading on the go so easy! Gotta be my laptop cause it’s really the only tech I own, other than a Smart thermostat! Heck, I don’t even have a Smartphone. So my laptop keeps me connected to the outside world and I use it every day. Would be lost without the internet, for sure! I couldn’t live without my smart phone. I have so much information on it that I use daily. my fav tech is camera . I love to take photo and moments that I don’t want to let it go. Even we know how good smatphone camera was ,nothing can’t beat camera power. But the phone seems so obvious. The other gadget is my HP laptop for school and my Google Chromecast to watch Netflix on the big screen. My favorite tech is my smartphone but I try to limit my usage. My favourite is my Kobo. Not very teckie, but I can’t go anywhere without it. My samsung A8 as it is so versatile. I love our google home mini! My favourite tech device is definitely the iPhone. I, as well as many others, would be lost without it these days. My fav tech has to be my smartphone, but mainly for taking pics of my family! Love the convenience. I recently installed an ecobee4 thermostat. I love it! My favorite tech is my smartphone!! My favourite tech is my iphone. I use it daily. I love my phone, probably too much! My favourite tch in my life is my computer-I like to be able to look up anything on it. It helps me in many ways daily. I loveeee my MacBook Pro and I have for a long time! My favorite is my IPAD. I can take it anywhere and facetime with my family at any time. Definitely my favourite tech is my phone!